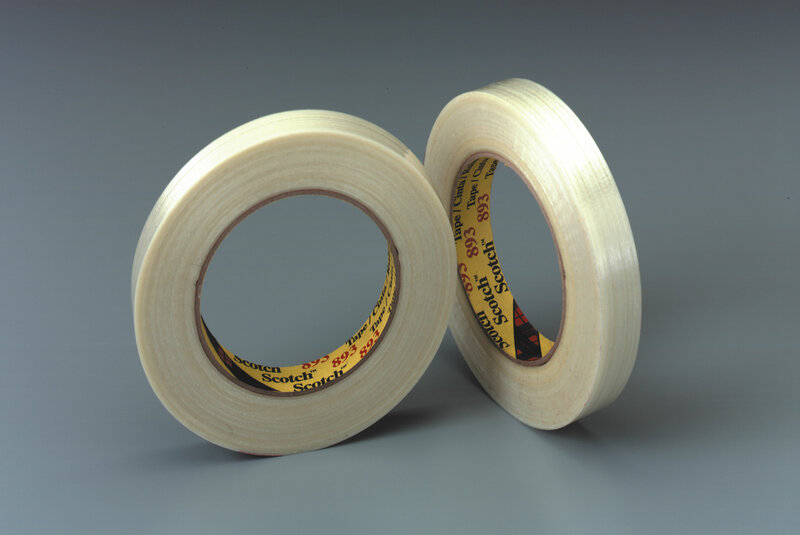 Scotch® Filament Tape 893 3M 893 | Fabrico, A Division of EIS, Inc.
Scotch® Filament Tape 893 is a clear polypropylene backing reinforced with glass yarn filaments with a synthetic rubber resin adhesive. Scotch® Filament Tape 893 provides 300 lbs./in. width tensile strength ideal for strapping, bundling and reinforcing applications. High performance polypropylene backing reinforced with continous glass yarn. Polypropylene backing is easy to handle and dispense. Provides excellent resistance to nicks, abrasion and moisture. Good balance of adhesion and high shear strength. Applications include bundling, reinforcing, palletizing, L-clip closures. High strength filament reinforced strapping tape provides excellent resistance to nicks and abrasion. High strength filament reinforced tape for demanding applications. General industrial, government, food and beverage and automotive parts. Box closing, palletizing, combining, box reinforcing, and general bundling.